Time Well Spent- Reminiscing with my Kids! So this past weekend our family spent time on the farm (none of us live there anymore) just hanging out. We all went for a walk to the “back side” of the place when on the way back my kids (now 16 and almost 20) wanted to “go exploring, like when we were kids”. See when they were little we lived on the farm and they roamed those woods all the time. They would be bored on a beautiful day, so I would tell them, “Put on your hiking boots” and we would go “exploring”. 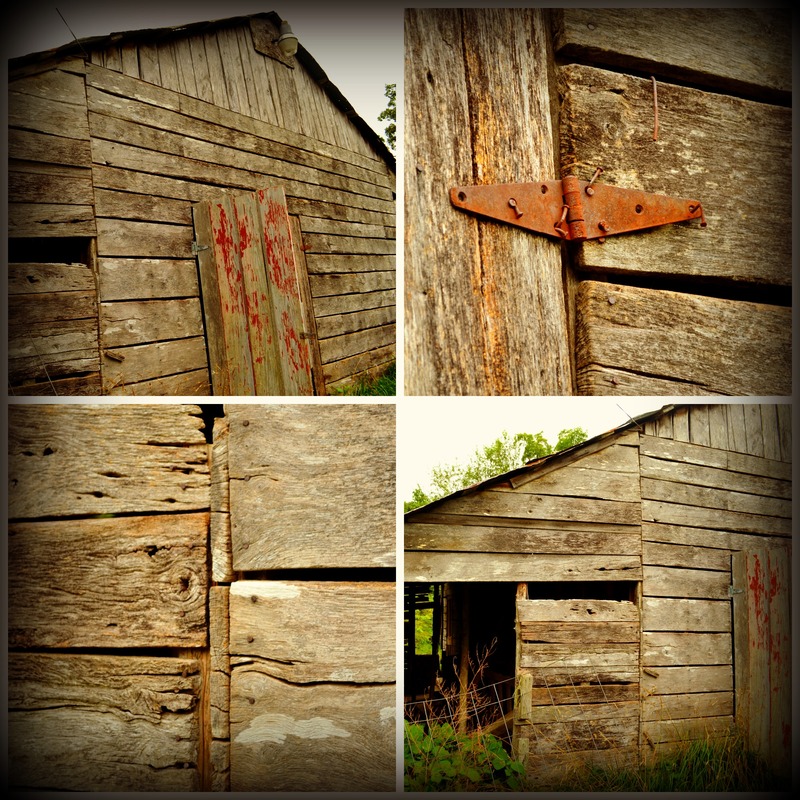 The farm is an old place that has been in my husbands’ mothers’ family for many generations. They would find “treasures”, such as old glass soda bottles, a canning jar, neat rocks, cool shaped sticks, etc. Then when their daddy got home from work, they had the “treasures” lined up on the porch for him to marvel over. This is the old barn, holds a lot of memories. When my kids were little they kept their baby bottle calves in this barn. They climbed in the old hay loft and “explored” it too. It was built by their great-great grandfather. So Sunday afternoon we went off into the woods, “exploring”, or maybe I should say reminiscing. I would see the large flat rocks and it would tale me back to when they were little walking this very place. And then we got to the old spring, where their great-great grandmother used to carry her wash to, because they had no running water. It was a very good day! My daughter found some pretty pieces of wood that she may use for decoration at her wedding this fall. My son found a very old cow skull. So we found some “treasures” this time too! 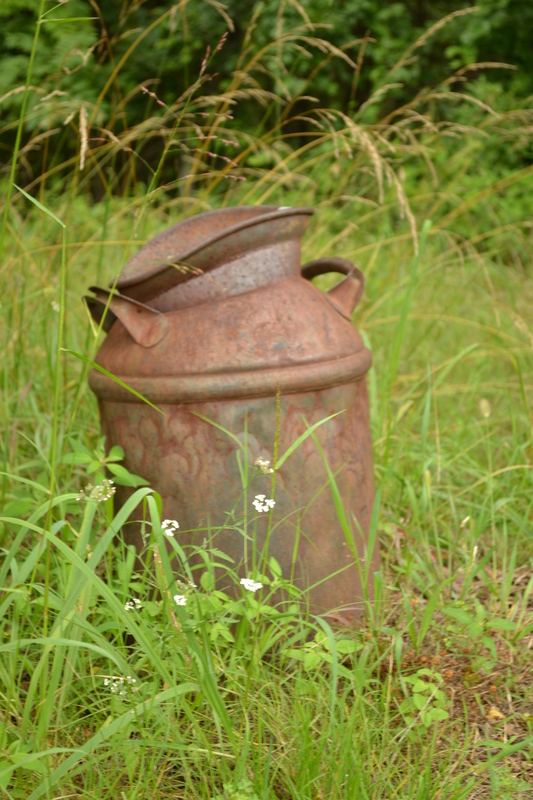 An old cream can, just sitting by the old car shed. I love spending time with my family, that time is priceless. I hope all are having a wonderful week thus far! Mine has been busy, but great! Thanks for stopping by and God Bless! The Countdown to Summer Break!! We also have a family vacation to the beach planned and I am very excited about that. I have started scouring the internet for good coupons to use while we are vacationing- after all I gotta stay frugal no matter where I’m at. It has been busy at school, finishing up all the end of year reports and such and all the trips and activities associated with end of the year. It’s also been busy at home, my husband and I raise registered puppies and have had 4 litters in the past 5 weeks, so we’ve been running like crazy. I love raising dogs though, my dogs are part of my family and I wouldn’t want it any other way. I would love to hear about ways you save on vacation, as well as things you enjoy in the summer. Have a Blessed rest of the week! School Nursing, my calling for sure! I have been a nurse for about 9 years and I have loved every aspect of it, from the disgusting to the seemingly mundane. I worked at a hospital in the medical-surgical department when I first started, then I worked at a clinic for a wonderful doctor for a few years, and 2 years ago I found my true calling: school nursing. I know what you might be thinking, you’re a band-aid station, right? There is so much more to school nursing than just cuts and scrapes. I have learned a lot in the short 2 years I have been there with the kids, they amaze me at their strength and wisdom. I feel like it’s the best job in the world and I am just lucky enough to get to do it. I had a little girl draw me a card and it just melted my heart. She has a lot of struggles and she took time to make me a card telling me I was her hero, it just made me realize that I make a difference sometimes when I don’t even know it. I try to always be super positive with the kids and to let them know that I have faith in them and that they can do anything. Finding contentment can come in many forms, whether it be your job, your home, your spouse, your children, etc, the point is that when you find contentment, the joy of life follows. I hope you have the courage to work on being content and finding joy, because it fills voids in your life that material things will never fill. May God bless you! I would love to hear about ways you find contentment in your life!